Hi everyone, hope you are enjoying this site we have created. We would love to hear your feedback! How can we improve our platform? Post your suggestions in replies here. Nice work. 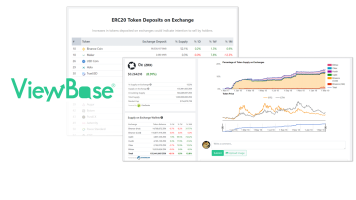 Would it be possible if you can add some filters for the exchange deposit tracker (e.g. market cap, exchange listed)? Hi, thank you for your feedback. Adding filters is a good idea. We will include it in our to-do list. 356,701 R ($45,216) is withdrawn from exchange wallets in the past hour. Large withdrawals may indicate intention to accumulate. 602,708 R ($76,097) is withdrawn from exchange wallets in the past hour. 2,380,756 PAT ($6,208) is withdrawn from exchange wallets in the past hour. 1,267,316 HT ($3,054,233) is deposited into exchange wallets in the past hour. Large deposits may indicate intention to sell. 13,078,000 MTH ($339,416) is deposited into exchange wallets in the past hour. 1,032,176 HT ($2,453,329) is withdrawn from exchange wallets in the past hour. Do not panic: Large withdrawal of TrueChain is due to mainnet swap. We will be delisting TrueChain from our tracker. Cosmo Coin (COSM) has been successfully updated to its new token address. On a side note, its chart looks like a classic exchange listing dump, which we have seen so many times before. COSM's large drop in deposits is due to its smart contract upgrade last week. We are in process of updating Cosmo's token address to reflect the correct balance. 1,531,825 HT ($3,606,967) is withdrawn from exchange wallets in the past hour. 1,209,093 HT ($3,010,642) is deposited into exchange wallets in the past hour. 836,329 HT ($2,079,671) is withdrawn from exchange wallets in the past hour. 2,684,850 HT ($6,665,309) is withdrawn from exchange wallets in the past hour. 2,642,026 BTMX ($253,369) is withdrawn from exchange wallets in the past hour. 505,422 DAI ($490,217) is withdrawn from exchange wallets in the past hour. 23,616,216 MXC ($228,470) is deposited into exchange wallets in the past hour. 120,018,146 ANKR ($1,237,651) is withdrawn from exchange wallets in the past hour. We welcome writers to publish on our platform. Any articles on cryptocurrency is welcomed - news, analysis, reports, and press releases. Submit your articles here and we will approve them for after review if it meets our publishing standards. We value your privacy and will never ask for or share personal information.